Relative diversity and representation of peripheral T cells bearing different TCR Vβ families are remarkably tightly regulated between birth and advanced adulthood. By contrast, individual elderly humans and C3H.SW and B10.BR aged mice display drastic disruption in such regulation. It was suggested that the alterations in the murine aged T cell compartment were due to age-related clonal T cell expansions (TCE). Here, we studied the kinetics of homeostatic dysregulation of T cell populations in aged C57BL/6 (B6) mice. Using mAb staining, we show that the percentages of αβ+CD8+ or CD4+ T cells bearing different TCRVβ elements remain virtually constant in mice up to 12 mo of age. In 22-mo-old mice, however, there is a dramatic disturbance of this pattern owing to the emergence of CD8+ TCE. Expanded T cells did not show any obvious bias in Vβ usage and were derived in all cases examined thus far from a single clone. TCE appeared later in life, compared with B cell clonal expansions. However, and in contrast to those detected in humans, TCE were frequently unstable disappearing within 2–4 mo, with other TCE appearing within the same time frame. Additional studies carried on thymic T cells, thymectomized mice, and young T transferred cells into Rag1−/− mice suggest that the clonal expansions occur in the periphery and that their onset is accelerated by decreased thymic output and/or function(s). The immune system faces constant challenges from pathogens. To ensure survival and health, this system must resolve each challenge swiftly and efficiently. A diverse repertoire of peripheral lymphocytes is required for optimal immune function because it allows recruitment and activation of lymphocytes of complementary and/or redundant specificities upon antigenic stimulation. Functional redundancy of activated lymphocytes ensures maximal efficiency in pathogen clearance. Immunological senescence is characterized by thymic involution and by a subsequent decrease in naive T cell production. Thus, with age, the peripheral T cell compartment progressively ceases to be renewed. Consequently, to continue to function, the peripheral T cell compartment must adapt to immediate immunological priorities. These adaptations involve repeated cycles of clonal selection, expansion and deletion, and residual immune memory. In a nonrenewing T cell population, such changes can be predicted to scar the peripheral repertoire by altering its structural diversity as well as functional responsiveness. In fact, a decrease in the immunological competence of the aged immune system is well established (1). Some of the documented consequences include the decreased capacity of T cells to specifically clear pathogens, the reduced efficiency of vaccination in aged individuals, the reactivation of previously contained pathogens, and the appearance of age-related clonal T cell expansions (TCE)3 (2, 3, 4, 5). 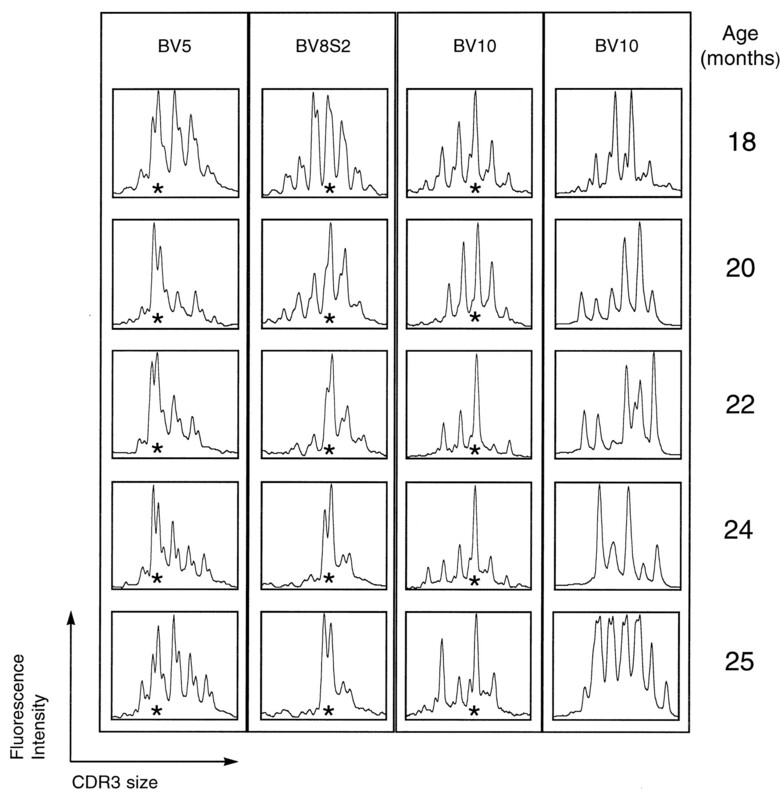 Previously, it was shown that the percentage of αβ+CD8+ T cells bearing particular Vβ elements varies considerably between aged individuals in humans, as well as between individual aged C3H.SW and B10.BR mice, although it is remarkably constant among individual young humans and mice within a given strain (2, 3, 4). In the mouse system, such TCE can be transferred into young irradiated recipients and even cultured in vitro. However, they expand slowly and are difficult to maintain in vitro. It was strongly suggested that expanded T cell populations are clonal, as they have been reported to be in humans, and similarly to age-related B cell clonal expansions (2, 3). Here, we expand these findings to the C57BL/6 mouse strain and establish that age-related T cell expansions are indeed caused by clonal expansions of CD8+ T cells. We further show that expanded T cells appear late in life compared with their B cell counterparts, and longitudinal studies showed that their frequency increases rapidly after the age of 18 mo. Unexpectedly, most TCE are long lasting but nevertheless transient. For this reason, the T cell repertoire of aged mice seems highly unstable, rather than terminally altered, although infrequent stable alteration can be seen. Additional studies carried on thymic T cells, thymectomized mice, and young T transferred cells in Rag1−/− mice suggest that the clonal expansions occur in the periphery and that their onset may be accelerated by decreased thymic output and/or function(s). Female C57BL/6 (B6) mice 1.5, 3, 6, 9, 12, and 24 mo old were purchased from the National Aging Institute breeding program (Frederick, MD). Rag1 knockout mice (C57BL6J-Rag1tm1 Mom) were purchased from The Jackson Laboratory (Bar Harbor, ME), and MHC class I knockout mice were purchased from Taconic Farms (Germantown, NY). Adult thymectomy was performed as described (6, 7), except that vacuum suction was applied to remove the organ. Partial splenectomy was performed on 18-mo-old mice as described (8, 9). For surface staining, the F23.1 mAb (anti-Vβ8.1/8.2/8.3) was purified and conjugated to FITC in our laboratory. FITC-conjugated anti-TCRβ; anti-Vβ 2, 4, 5, 6, 8.3, 9, 10, 11, 13, 14; PE-conjugated anti-CD49d; and FITC- and APC-conjugated anti-CD62L mAbs were purchased from PharMingen (San Diego, CA). FITC-conjugated anti-Vβ 7, 12; anti PE-conjugated anti-CD4; and Tri-Color-conjugated anti-CD8 mAbs were from Caltag (San Francisco, CA). Analysis was performed on a FACScan instrument using CellQuest 3.1 software (Becton Dickinson, Mountain View, CA). At least 104 cells were acquired per sample. Dead cells were excluded by selective scatter gating. Total RNA was extracted using the RNA-Isolator Kit (Genosys Biotechnologies, The Woodlands, TX) and quantitated by OD. For cDNA synthesis, up to 5 μg of total RNA were reverse transcribed using the avian myeloblastosis virus-reverse transcriptase kit (Boehringer Mannheim, Indianapolis, IN) and oligo(dT)15 primers in a 30-μl reaction. After the reaction was completed, 30 μl double-distilled water were added. Oligonucleotides specific for the murine Vβ families (BV primers) and for the Cβ genes (BC primers), as well as the 5-carboxyfluorescein (FAM), 6-carboxy-X-rhodamine, or 6-carboxy-N,N,N′,N′-tetramethylrhodamine-labeled BC_RO primers (BC_RO_X) are listed in Table I⇓ and Ref. 10 . PCR and runoff reactions were performed as previously described (11). Briefly, classical PCR were performed on 2–5 μl cDNA in 25 μl with a sense primer specific for a BV family and an antisense primer specific for the constant BC region (BV and BC1 primers). For these PCRs, we used 0.2 μM concentrations of each primer, 1.5 mM MgCl2, and 1 U Taq DNA polymerase (Perkin-Elmer, Roche Molecular Systems, Branchburg, NJ). The PCR products were visualized on a 1% agarose gel by ethidium bromide staining. Two microliters of the BV-BC1 PCR products were then labeled by 10 cycles of runoff elongation using the fluorescent BC_RO_X primers. Runoff elongation products, mixed with the same volume of 95% (v/v) formamide/10 mM EDTA, were run on a 6% acrylamide sequencing gel (FMC Bioproducts, Rockland, ME) loaded on an automated ABI 377 DNA sequencer (Applied Biosystems, Foster City, CA). 6-Carboxy-X-rhodamine-labeled size markers GS350 (Applied Biosystems, Foster City, CA) were also loaded. Size determination of the runoff products and CDR3 size analysis was performed with Immunoscope software (11). For sequencing, BV-BC1 PCR products were purified using the QIAquick PCR purification kit (Qiagen, Valencia, CA). One-fourth of the purified PCR products were then sequenced using the nested BC3 primer or the appropriate BV primer and the BigDye Terminator sequencing kit (Applied Biosystems). Nucleotides contributed by the BV, BD, or BJ genes were identified by alignment with germline gene sequences (12). For these studies on the influence of age on T cell subpopulation percentages, we chose to follow 1) TCRVβ protein expression using all available TCRVβ-specific mAbs and 2) diversity at the level of Tcr-β gene rearrangement using TCRBV CDR3 length analysis. Thus, the terms Vβ and BV will be used for the protein and gene, respectively. Spleen cells of 5 individual mice aged 3, 6, 9, 12, and 24 mo were triple-stained with anti-CD4, anti-CD8, and with each of the available anti-Vβ mAbs. As described before, in 3-mo-old animals (1, 3), the proportions of CD4+ or CD8+ T cells expressing a particular Vβ element seem to be tightly regulated, because they did not differ from one animal to the other. The same was true of 6-, 9-, and 12-mo-old mice. In addition, no differences in the proportions of CD4+ or CD8+ T cells expressing a particular Vβ element were detected when mice of different age groups were compared. It has been previously reported that in old C3H.SW and B10.BR animals (3), proportions of T cell subpopulations expressing a particular Vβ element vary considerably between animals. We studied more than thirty 22-mo-old C57BL/6 mice. Similarly to findings published for the C3H.SW and B10.BR mouse strains, we observed expansions of some T cell subpopulations, sometimes to dramatic proportions. These expansions involved the CD8+ but not the CD4+ T cell subset. CD8+ TCE did not seem to exhibit any bias in Vβ element utilization, suggesting that they were equally recruited from among T cells expressing all TCRVβ families. Fig. 1⇓ shows representative FCM results obtained for the CD8+ subset of two mice younger than 12 mo and three 22-month-old mice. Homeostatic disturbance in relative Vβ representation among CD8+ T cells. Splenic T cells from five 3-, 6-, 9-, and 12-mo-old mice and from thirty 22-mo-old mice were triple-stained with CD4-, CD8-, and Vβ-specific mAb, and the proportion of T cells expressing a particular Vβ element was determined for the CD4 and CD8 subsets. No significant differences were found between mice of different ages for T cells of the CD4 subset. An example of the results obtained for the T cells of the CD8 subset from two young (<12-mo-old) and three old mice is shown. The two young controls show the same percentages of CD8+ T cell expressing a particular Vβ element. This was true of all mice up to 12 mo of age. The three old mice showed significant alterations of these proportions, with expansions mainly in the Vβ8 family. Total RNA was extracted from the samples analyzed by FACS as above, and CDR3 length analysis was performed for every functional BV gene, to evaluate the diversity of the quantitatively expanded and nonexpanded T cell populations. We found a strong correlation between alteration of the percentages of CD8+ T cells expressing a particular BV gene and alteration of the TCRBV CDR3 length analysis patterns for this same population. Indeed, in mice up to 12 mo of age, the CDR3 length analysis patterns were bell-shaped (i.e., “polyclonal” in Fig. 2⇓A, Box 1) and indistinguishable regardless of age. This strongly suggests that the TCR diversity of T cells remains unaltered between the ages of 3 and 12 mo. This apparent stability of the overall TCR repertoire at the molecular level correlates tightly with the stability of the percentages of T cells expressing a particular Vβ segment seen in Fig. 1⇑. Clonal expansions of CD8+ T cells are responsible for the alterations in the size of CD8+ T cell populations expressing a particular Vβ element. CDR3 length analysis was performed on splenic T cells of the same 3-, 6-, 9-, 12-, and 22-mo-old mice and for the same Vβ elements as in Fig. 1⇑. A, CDR3 length analysis patterns were subdivided into three categories (left to right): box 1, unaltered peak pattern of characteristic bell shape, corresponding to a repertoire of maximum diversity; box 2, altered peak pattern showing multiple peaks but no bell shape, corresponding to a repertoire of lesser diversity or altered by modest clonal expansions; box 3, dramatically altered pattern showing only one peak, corresponding to a dramatic clonal expansion and reduced diversity. 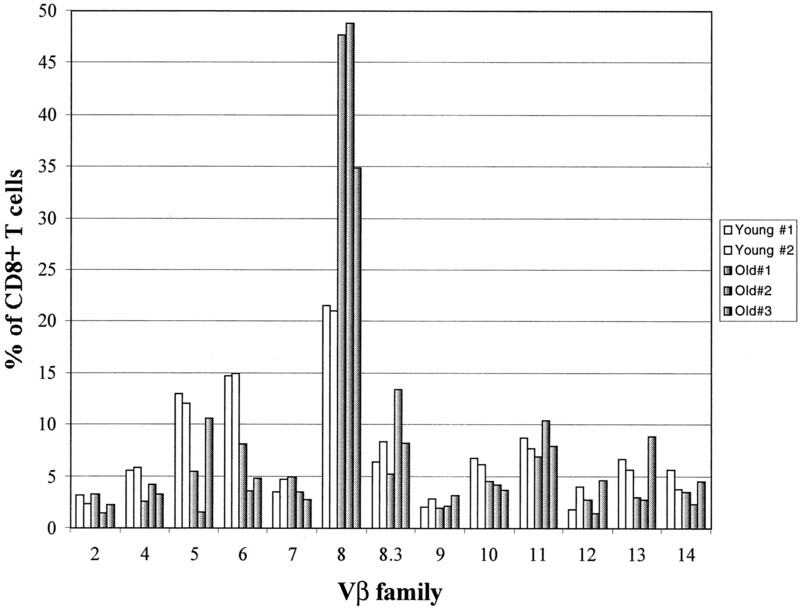 B, Representative set of results for five Vβ families in an individual mouse where all three types of CDR3 length analysis patterns can be observed. C, The results of CDR3 length analysis for the same mice as in Fig. 1⇑ were plotted on the same graph as the FCM results as follows: y-axis denotes the percentage of total CD8 T cells expressing each Vβ family by mAb staining. The percentages obtained for mice 12 mo of age or younger are shown in the left column for each Vβ family, and the percentages obtained for 22-month-old mice are shown in the right column. Each symbol represents the percentage obtained for an individual mouse; symbols themselves indicate the CDR3 length pattern observed for the corresponding Vβ family in each mouse, as follows (inset): ▬, unaltered, bell-shaped, CDR3 length patterns; ▵, significantly altered (skewed) CDR3 length patterns in which several CDR3 length are still present; ○, dramatically altered CDR3 length patterns in which only one CDR3 length was detected. When TCRBV CDR3 length analysis was carried on the same thirty 22-month-old mice as above, two types of CDR3 length patterns were noted. Although many CDR3 length patterns were unchanged as compared with the 3–12-month-old controls, others exhibited significant changes, sometimes of dramatic proportions (Fig. 2⇑A, boxes 2 and 3). Representative results for a 22-mo-old mouse are presented in Fig. 2⇑B. The alterations in TCRBV CDR3 length patterns were of two magnitudes: 1) small alterations, with losses of the characteristic bell shape but clear maintenance of the other parameters indicating relative CDR3 length diversity (Fig. 2⇑B, BV2 and BV12); and 2) dramatic alterations, with the detection of only one CDR3 length (Fig. 2⇑B, BV10). Invariably, alterations of the CDR3 length patterns happened in the T cell populations expressing a Vβ protein for which the percentage of CD8+ T cells was altered by mAb staining (Fig. 2⇑C). T cell populations bearing Vβ families that exhibited only slight CD8+ T cell expansions were also those for which only small alterations of the TCRBV CDR3 length patterns were detected (small TCE). By contrast, large expansions of the percentages of CD8+ T cells expressing a particular TCRVβ protein corresponded to the most dramatic alterations of the CDR3 length patterns. In cases where only one CDR3 peak was detected per TCRBV family, CDR3 were sequenced using the BV-BC PCR product as a template. All such PCR products yielded clear and unambiguous CDR3 sequences, indicating that the great majority of the BV-BC PCR product was made up of only one sequence (data not shown). This indicates that the expansions detected by mAb staining were due to the expansion of clonal T cells. Furthermore, we conclude that there is precise correlation between the TCE detected by FCM and the appearance of expanded clones detected by TCRBV CDR3 length analysis at the molecular level. To further investigate the kinetics of appearance and the stability of TCE, we followed a set of eight mice over time using TCRBV CDR3 length analysis of PBLs at 18, 20, 22, 24, and 25 mo. Analysis was performed for all functional BV genes at 18 and 25 mo of age and for BV4, BV5, BV6, BV8S2, and BV10 at 20, 22, and 24 mo of age. At 18 mo of age, only two mice showed TCE, none of them in BV4, BV5, BV6, BV8S2, or BV10. For the later time points, however, such clonal expansions could be detected with increasing frequency (Table II⇓). Consequently, at the age of 25 mo, 60% of the mice had developed at least one TCE (study conducted on a cohort of 20 mice, data not shown). To more closely study the kinetics of appearance and the stability of individual TCE, we compared the CDR3 length profiles at all five time points for the five Vβ families selected for study. We focused on TCE, defined as a unique peak (CDR3 length) in the CDR3 length pattern of a particular BV rearrangement. Once a TCE was detected at any time point in a particular mouse, it was closely followed by CDR3 length analysis at all other time points, focusing on the same CDR3 length as that of the TCE. A repre-sentative set of results is shown in Fig. 3⇓. Many of the TCE were transient and dominated the CDR3 length patterns of a Vβ family at one or two successive time points only. This is illustrated in column 1 in which a BV5 clonal expansion is not detected at the age of 18 mo, dominates the BV5 CDR3 length pattern at 20 mo, “fades” and loses its dominance of the patterns although still altering them at 22 and 24 mo, and has completely disappeared at 25 mo. Some of the T cell clones, however, remained stable. This is illustrated in column 2: at 18 and 20 mo, the CDR3 length patterns for the BV8S2 family are not altered; at 22 mo, the pattern is altered by the expansion of one peak which, at 24 and 25 mo dominates the repertoire completely. In columns 3 and 4, the most common situation is shown; no clonal expansion dominated the CDR3 length patterns completely at any time point. However, the CDR3 length patterns were often altered. In column 3, for example, an alteration appears at 22 mo, is still present at 24 mo, and has faded at 25 mo to be replaced by another. Similarly, in column 4, the CDR3 length patterns change significantly at each time point between the ages of 18 and 25 mo. Overall, of 60 mice analyzed, 19 (32%) had at least 1 TCE at 18 mo, and that number increased to 34 of 60 (57%) at 20 mo. When the same group of mice was followed for the stability of clones in 6 BV families (BV 2, 3, 5.2, 9, 11, and 12 (Table III⇓)), 6 of the initial 14 TCE (in as many mice) persisted, whereas the others receded to background. These data show that the repertoire of aged mice is highly unstable, as compared with the virtually constant repertoire of mice between 3 and 12 mo of age. They also indicate that T cell clonal expansions, although frequent and sometimes dramatic, are frequently fluid and unstable, particularly in early senescence. Kinetics and stability of T cell clonal expansions. PBLs from eight C57BL/6 mice were sequentially isolated at the ages of 18, 20, 22, 24, and 25 mo; CDR3 length analysis was performed for the Vβ families BV4, BV5, BV6, BV8S2, and BV10; and the profiles were compared. From this analysis, representative cases are shown. For each repertoire, an asterisk marks the CDR3 length of interest. Transient clonal expansion (column 1), appearance of a TCE at the age of 20 mo, which slowly disappears between the ages of 20 and 25 mo; stable T cell clonal expansion (column 2), a TCE develops between the ages of 20 and 22 mo and remains thereafter; transient instability of the T cell repertoire (columns 3 and 4), numerous significant alterations of the CDR3 length patterns can be observed between time points, without development of a T cell clonal expansion of dramatic proportions as it is the case in columns 1 and 2. Columns 1–4 are designated from left to right. To determine whether the T cell clonal expansions detected in the periphery originated from the thymus or from peripheral cells, we compared the CDR3 length profiles of PBLs and of the thymic cells of 20-mo-old animals. Although peripheral TCE were clearly detected among PBLs, they were never found in the thymus of the same animals (not shown). This strongly suggested that TCE originate from the periphery. To further investigate this hypothesis, we transferred peripheral T cells from old mice with clonal expansions and from young control mice into Rag1-deficient animals, devoid of lymphocytes. Six months after transfer, PBLs were collected, CDR3 length analysis was performed, and the profiles before and after transfer were compared (Fig. 4⇓, Old Donor). Of 20 attempted transfers, only one T cell clone (5% frequency) could be transferred successfully (not shown). All other T cell clones had completely disappeared, indicating that such T cell clonal expansions were of the “transient” type described above, that such T cell clones grow much more slowly than other T cells that are not expanded, or that their growth in the donor mouse was driven/supported by elements not transferred to the Rag1-deficient recipients. The most interesting finding, however, came from the fact that 1) although the T cell clones present in the donor mice had disappeared 6 mo after transfer (Fig. 4⇓, lower panel, BV10 and, to a lesser extent BV20), new clonal expansions had arisen (Fig. 4⇓, Old Donor, BV9 and BV15), and that 2) T cell clonal expansions had developed in a similar fashion in the recipients that had received PBLs from young control mice (Fig. 4⇓, upper panel, BV9 and BV20). T cell repertoire diversity alterations after transfer into Rag1−/− recipients. Lymph node T cells (1 × 106 total) from young mice or old mice with T cell clones were transferred i.v. into young Rag1−/− mice. Six months after transfer, the recipients were sacrificed, and CDR3 length analysis was performed on splenic cells for all functional Vβ families. A, Representative result for five transfers of T cells from young donors. 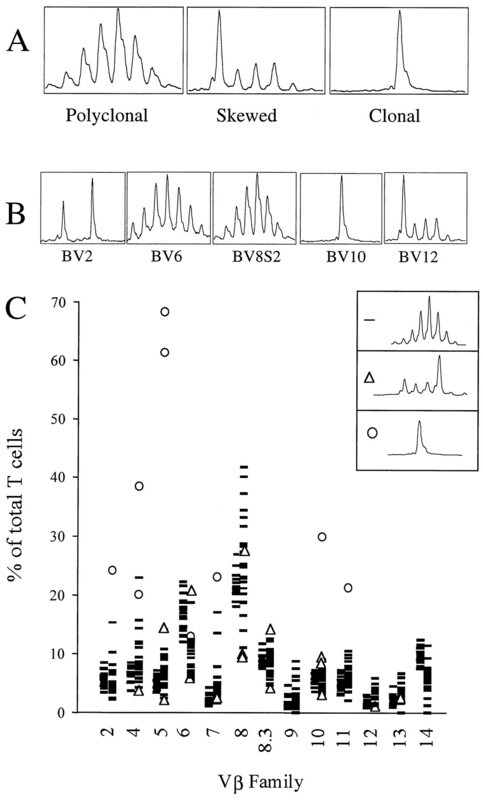 Six months after transfer, the original T cell diversity was lost, and TCEs were observed (BV9 and, to a lesser extent, BV20). B, Representative result for 9 of 10 transfers of T cells from old donors with TCE. Six months after transfer, the original T cell clones (BV10 and, to a lesser extent, BV20) had disappeared from the peripheral T cell repertoire, but others (BV13 and BV15) had arisen. Even when the same TCE-containing cell population was transferred into two recipients, the TCE arising were not necessarily identical. 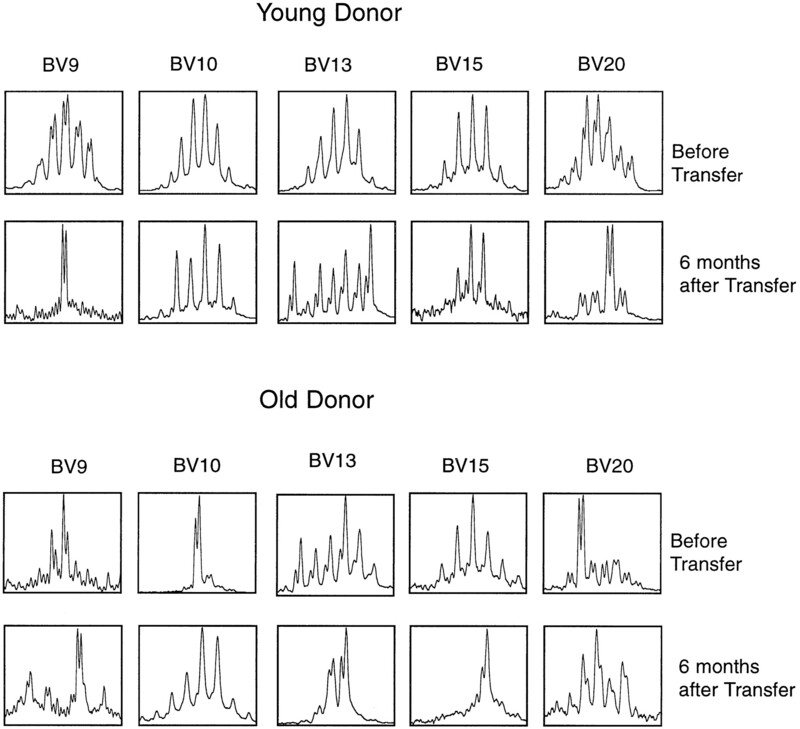 Although slight preferences were observed with regard to Vβ usage (e.g., Vβ5 and Vβ12), many newly arising TCE were distinct from one another, and the Vβ utilization did not correlate in any obvious fashion to the age of the donor. These results indicate that the age of the T cells themselves is not necessarily predictive of their propensity to produce TCE. Rather, the number of divisions that the transferred T cells have undergone to fill the empty lymphocyte compartment of the recipient might be responsible for the development of T cell clonal expansions. After they have repopulated the T cell compartment of the recipient, the transferred T cells have undergone a number of divisions compared with which the original differences in cell division history between the young and old donor T cells must be negligible. This might explain why transferred T cells from old mice did not give rise to more TCE in the recipient than T cells from young mice. This hypothesis is further strengthened by the fact that 18-mo-old mice that had been thymectomized at the age of 6 wk develop T cell clones twice as often as euthymic 18-month-old animals (J. LeMaoult, R. Dyall, and J. Nikolich-Z̆ugich, unpublished observations). To further investigate the age-related disturbance in T cell homeostasis, we took advantage of our capacity to study the diversity of the T cell repertoire at several levels, by associating mAb staining with TCR β-chain CDR3 length analysis and sequencing. We show that clonal expansions can be detected by mAb staining, extending the findings on the existence of CD8+ TCE bearing a particular V element to the C57BL/6 strain (3). Kinetic analyses show that these expansions are not detected before the age of 12 mo in these animals, and never in the CD4+ T cell subset. More importantly, using CDR3 length analysis in parallel with mAb staining, we undoubtedly established the clonal nature of the age-dependent T cell expansions. The reason for which TCE develop mainly in the CD8+ subset remains unclear; our studies on MHC class I-deficient mice showed that CD4+ TCE can develop, but studies carried on MHC class II-deficient mice confirmed that CD8+ T cell clones occur much more commonly (not shown). CDR3 length analysis enabled us to carry longitudinal studies on the T cell clonal expansions previously identified by mAb staining, and we showed that age-dependent T cell clonal expansions are often transient. Over time, however, stable clonal expansions do develop, sometimes to dramatic proportions. Overall, the T cell compartment seems to become increasingly unstable with age. Parallel CDR3 length analysis carried on the thymic and peripheral T cells suggested that T cell clonal expansions arise from the peripheral pool. This was strengthened by the finding that transfer of T cell clones into “empty” Rag1-deficient recipients was possible, although difficult. More importantly, the originally diverse old or even the diverse young T cell populations would generate clonal expansions rapidly if isolated and deprived of thymic input, either by adult thymectomy or by transfer to Rag1-deficient recipients. The simplest explanation for the transitory skewing of the CDR3 length patterns, as well as for the transitory clonal expansions is that they are the consequences of a single cause and may just represent normal, although accentuated, responses against foreign Ags. These responses would go unnoticed in young animals because of the availability of many relevant T cell clones with overlapping specificities for a given pathogen. This redundancy would allow numerous T cell clones to expand moderately and would increase the efficiency and efficacy of an immune response, speeding the clearance of the pathogen. Such polyclonal immune responses would not necessarily significantly disturb the Vβ mAb staining profile, nor would they obligatorily skew CDR3 length patterns, especially against a very diverse background that would “buffer” the CDR3 length pattern variations (Fig. 5⇓, situation A). The reason for which these benign immune responses would become TCE in an old animal is unclear. On the basis of our results, we propose that the T cell pool of such an animal is no longer diverse enough to select multiple T cell clones specific for the same pathogen. In such a “reduced diversity” system, the few T cell clones specific for the pathogen would need to expand more vigorously than in a young animal, in which more T cell clones can be recruited. Furthermore, in a reduced diversity system, T cells highly specific for the Ag might not be as available as in a diverse system. This would decrease the quality of the response, delay the clearance of the pathogen, and cause the selected T cells to multiply even more (Fig. 5⇓, situations B and C). If this is the case in aged mice, it is not surprising that their peripheral T cell repertoire seems to be unstable; greater clonal expansions against a less diverse, less buffering background would show (transiently) until the pathogen is cleared. As for the stable TCE, we hypothesize that they arise from transient TCE by losing responsiveness to homeostatic control mechanism(s). We do not know whether the TCE we detected were made up of premalignant or malignant cells. However, preliminary data show that they do not divide actively, not even to the pace of other, nonexpanded peripheral T cells (not shown). 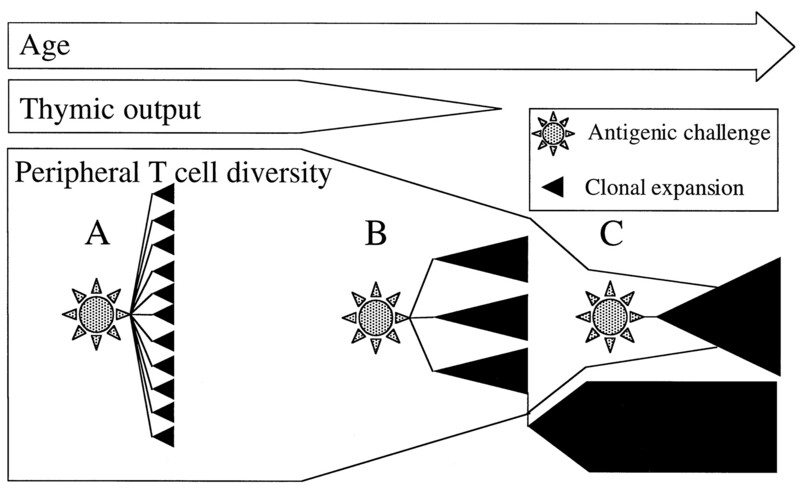 Schematic representation of the dynamics of peripheral T cell pool diversity loss and T cell clonal expansion development. In this schematic representation, the relative age of the mouse is indicated by the top arrow. In situation A, a young animal with high thymic output and a high peripheral T cell diversity responds to antigenic challenge by recruiting many T cell clones of relevant and overlapping specificities. The response is efficient, and the T cell clones specific for the Ag need to expand only moderately and briefly before the pathogen is cleared. In situation B, an older organism, with low or no thymic output and decreased peripheral T cell diversity, faces antigenic challenge by recruiting a limited number of T cell clones specific for the Ag. The immune response is less efficient than in situation A, and each of the selected T cell clones must expand more and for a longer time than in situation A to clear the pathogen. During one of these expansions, one clone becomes insensitive to homeostatic mechanisms, persists, and forces these mechanisms to compensate, further decreasing the peripheral T cell diversity. In situation C, an old organism, with peripheral T cell clonal expansions and a severely decreased peripheral T cell repertoire diversity, responds to antigenic challenges by recruiting a very restricted set of T cell clones of relevant specificities. These must expand greatly, but even so, the quality of the response might be too poor to ensure a fast clearance of the pathogen. Consequently, the expansions last longer than in situation A or even B. In a worst case scenario, the limited set of recruited T cell clones might not succeed in clearing the pathogen. Even if the stably expanded T cells do not actively divide and may not be activated, their presence might have devastating consequences. To cite only one, such a large clonal T cell population (TCE), by its mere size, would force the homeostatic mechanisms to compensate for increased cellularity. Given that TCE no longer respond to such mechanisms, the activity of homeostatic mechanisms would predominantly affect (and down-regulate) non-TCE cells, further increasing the diversity losses (Fig. 5⇑). Ultimately, such a deprived T cell pool is doomed to encounter a pathogen it cannot fight efficiently enough to ensure survival. Indeed, recent data from our laboratory confirm that TCE directly impact on the capacity of the immune system to efficiently respond to pathogens (J. LeMaoult, I. Messaoudi, B. M. Metzner, R. Rivi, K. Remus, M. E. Weksler, and J. Nikolich-Z̆ugich, manuscript in preparation). ↵1 This work was supported by U.S. Public Health Service Grant P01 AG-14669 from the National Institutes of Health (M.E.W., J.N.-Z̆. ), Memorial Sloan-Kettering Cancer Center Core Support Grant CA-08253, the Wright Chair in Geriatric Research (M.E.W. ), and the DeWitt Wallace Fund (J.N.-Z̆.). 3 Abbreviations used in this paper: TCE, T cell clonal expansion; CDR3, complementarity-determining region 3; TCRB, rearranged β gene of the TCR; FCM, flow cytofluorometric.